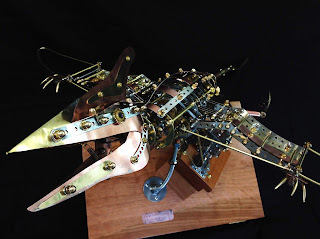 The Morris Museum is pleased to present Simply Steampunk, the second installment of the four-year juried exhibition series, A Cache of Kinetic Art, celebrating the Murtogh D. Guinness Collection of Mechanical Musical Instruments and Automata. Ann Aptaker, New York: Independent Curator, Art Writer, and Professor at New York Institute of Technology. Visitors are encouraged to actively participate in bestowing the People’s Choice Award. Voting by the public begins on Friday, March 15, 2019 on-site at the Museum and concludes on Sunday, June 30, 2019. The People’s Choice Award will be announced on the Museum’s website and through social media on Tuesday, July 2, 2019. 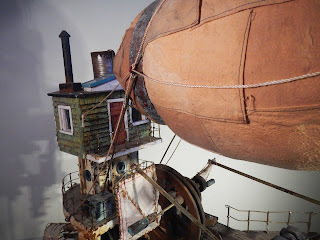 “The submissions for the second in our series of A Cache of Kinetic Art exhibitions have not failed to amaze us. Creative and beautifully executed artworks that incorporate movement are exponentially more difficult to conceptualize, not to mention fabricate while maintaining artistic integrity. The many challenges to overcome are why so few artists attempt it and why so few kinetic works are created each year. We’re very pleased that they can find an appreciative audience and venue here at the Morris Museum,” states Jere Ryder, Conservator of the Guinness Collection. Professor Ignatius and Assistants Flee the Citadel, 2018. LoHiFi Productions (Chris Little and Theofani Pitsiavas), Halifax, Nova Scotia, Canada. Information about the participating artists is available upon request. Guinness Collection Curator Michele Marinelli offers an entertaining journey into the world of kinetic artworks, including live demonstrations. This event includes light refreshments. Martin Scorsese. Parisian orphan Hugo discovers a mysterious automaton. Following the film, join the Guinness staff for a tour of Simply Steampunk. Join the Guinness staff at a maker’s workshop to assemble and decorate a kinetic sculpture to bring home. It’s a wonderful opportunity for children to invite their favorite adult to help create an automaton. Each child receives one kit. A parent must accompany the child attending but has free admission. Mad science and time travel! Accompany the Guinness Collection staff into the world of steampunk kinetic art to catch a final glimpse before it closes. Artist David Bowman will join this tour to share his insights on his works in this exhibition! The Museum is located at 6 Normandy Heights Road (at the corner of Columbia Turnpike) in Morristown, NJ, and is open Tuesday, Wednesday, Thursday, Friday and Saturday, 11:00am to 5:00pm and Sunday, 12:00 to 5:00pm. In addition, the Museum is open evenings from 5:00 to 8:00pm on the second and third Thursday of the month. Admission to the Museum is $10 for adults and $7 for children, students and senior citizens. Admission is always free for Museum members. For more information, call 973.971.3700, or visit www.morrismuseum.org.